Hi all! Great Lakes Lacquer is one of several brands working with HHC to release monthly exclusives based on a recurring maker-chosen theme. GLL has chosen The Lord of The Rings, so today I have "You Shall Not Pass" to share with you all. I'll have another precious to share in June, but more on that later. Available May 14th, 2018 @ 12:01 am EST through May 21st, 2018 @ 11:59 pm Hawaiian time. 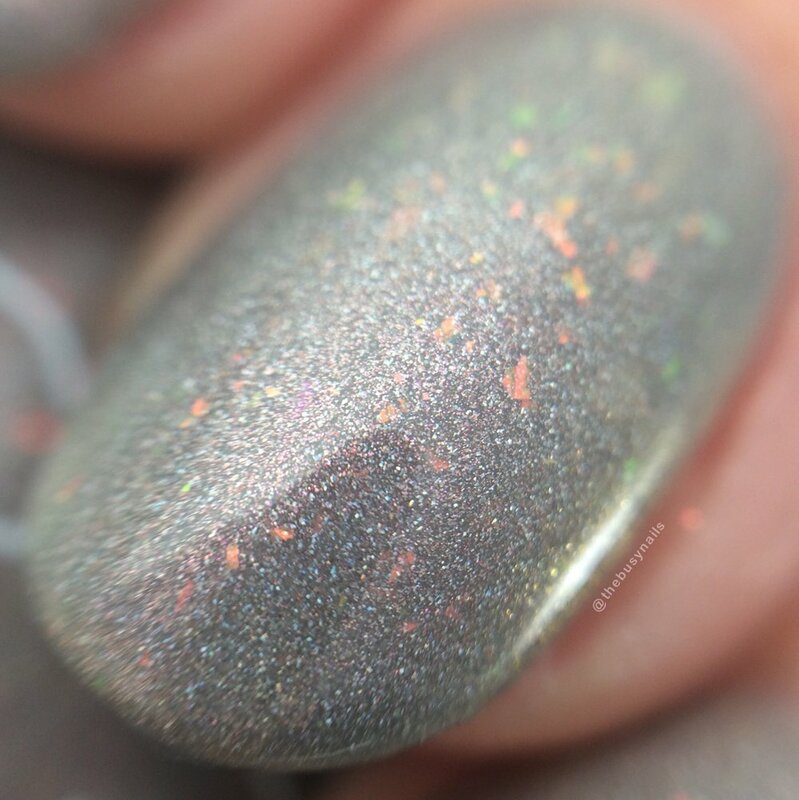 Maker description: a dingy gray linear holographic filled with shifting flakes and shimmer that goes from a copper red to orange to green (yes, this is the aurora pigment that mimics UP). My thoughts: First of all, the formula is excellent. Smooth and easy to work with, just like nearly every GLL I've tried. I'm a grey lover first and foremost, so Mariah was sweet enough to send me this to swatch, even though I wasn't sure I could commit to the turnaround time. When I read the description and saw the bottle, I quickly made time in my schedule for this baby. I love that even though it's filled with shimmer and flakes, the subdued base color makes this a really wearable neutral in my opinion. 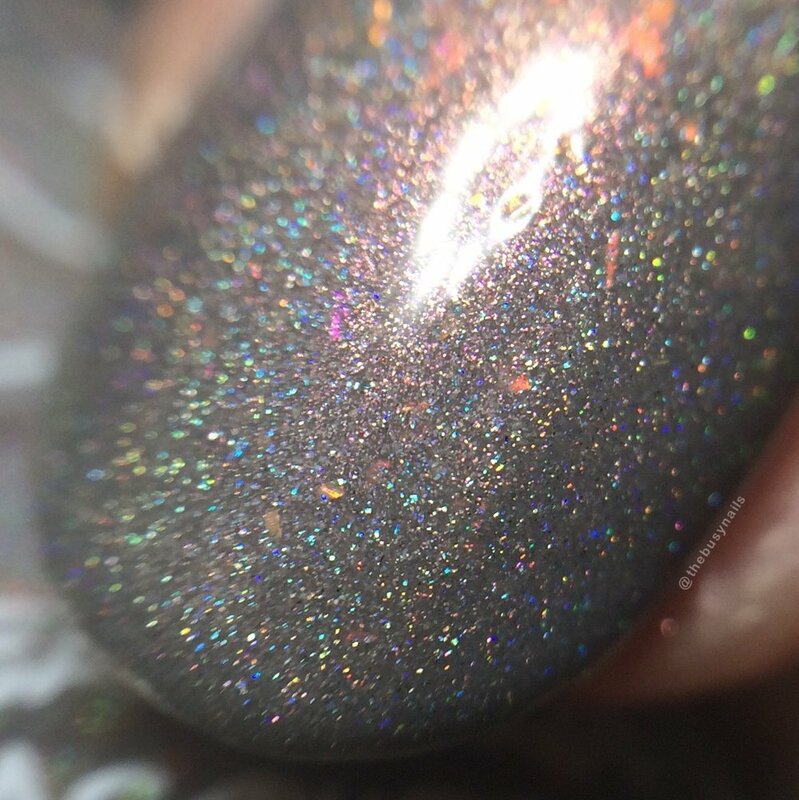 Photo notes: Photos 1-5 were taken under direct light to show the holo, 6 & 7 in a lightbox to show the flakes, and 8 is a collage to show the many shifting colors of shimmer. You can purchase "You Shall Not Pass" in the Hella Handmade Creations shop, May 14th, 2018 @ 12:01 am EST through May 21st, 2018 @ 11:59 pm Hawaiian time.